If you have cathedral ceilings, a high-vaulted foyer or another room in your home where the ceiling is rather high, a chandelier can add just the right decorative touch and provide a brilliant source of light for the space. The only problem, however, is that with so many bulbs, the potential for a problem is higher with a chandelier than with a single bulb fixture. If you have a five-bulb chandelier that has one or two bulbs that aren't lighting even after you insert new ones, don't throw it away just yet. With just a few minutes, some basic materials and this article, you can learn how to wire a five-bulb chandelier, thus allowing you to save not only money, but your chandelier as well. Turn off the breaker that powers the chandelier. Set up the ladder so that the chandelier will be in front of you, not directly above you. Take a piece of electrical tape, stick it to the arms that have the non-working lights and remove the chandelier. It helps if you have someone standing nearby so you can lower the chandelier to them rather than holding it while you are trying to step down the ladder. Remove all of the light bulbs from the chandelier. Depending on how the chandelier is wired, you will either see all of the wires from each socket combined in the canopy of the light or they will all be grouped in another part of the light, usually the bottom. If the chandelier only has 2 wires coming out of the top, then the branch wires are located in the bottom. Remove the nut from the bottom cap, and you should see the wires underneath. Locate the arms that have the electrical tape on them. At the point where the arm meets the junction box, identify the wires and remove them from their wire connectors. Do this with each arm that isn't working. Loosen and remove the socket from the affected arm(s). Depending on how the chandelier is constructed, you may have to unscrew it, loosen a nut or loosen a set-screw. Lift the socket out and pull all of the wire out with it. Loosen the terminal screws on the socket and remove the wires. Take the lamp cord and fish it through the chandelier's arm. Insert it from the socket portal through to the junction box. Make sure enough wire comes out into the junction box before you cut the wire. Cut the wire coming out at the socket end. Leave about 6 inches of wire coming out of the arm. Split the lamp cord down the middle so you have two individual wires. Use the wire strippers to remove about 3/4 of an inch of insulation from each wire. Twist the stranded wire to help keep them together and bend the wire into a hook shape. Wrap the exposed wire around one of the terminals on the socket and tighten the screw down to secure the wire in place. Follow the same steps for the second wire. Pull the wire in the junction box until the socket is in place. Then secure the socket to its seat. Separate the lamp cord on the junction box side and use the wire strippers to remove the insulation like you did earlier. Connect one wire to the group of wires connected to the black wire and the other wire to the group of wires connected to the white wires. Follow these steps for each arm of the chandelier that wasn't working. 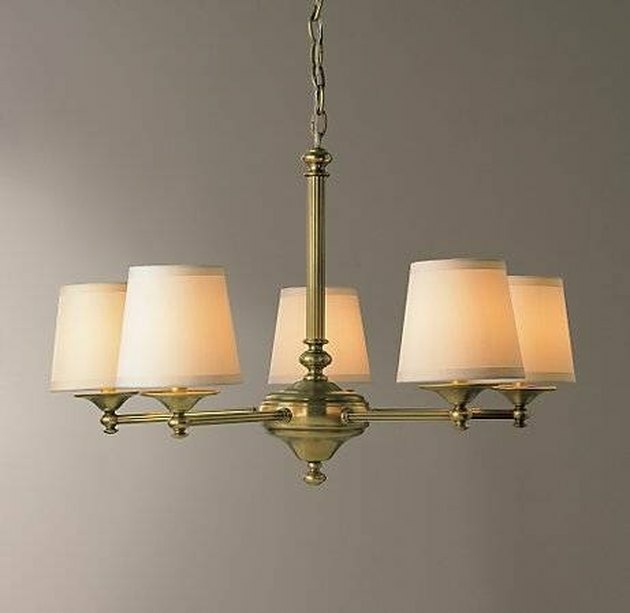 When finished, make sure all of the wire connectors are on tight, reinstall the junction box cover and light bulbs and then reinstall the chandelier. Turn the breaker back on and test the chandelier.